WASHINGTON, D.C. — Senior African security-sector leaders met with their U.S. counterparts for the annual African Executive Dialogue (AED), organized by the Africa Center for Strategic Studies (ACSS) in collaboration with the Office of the Secretary of Defense (OSD), the U.S. Africa Command (USAFRICOM), and the U.S. Department of State. The three days of talks opened May 28, 2014, in the Virginia suburbs outside Washington. This high-level meeting, the third of its kind since 2012, brought together a select group of high-ranking African leaders (including current or recently retired government officials and representatives from the African Union and Regional Economic Communities), joined by officials from the U.S. government and the United Nations. Participants at the talks are ministers, heads of mission, chiefs of defense staff, and other senior executives. Over the course of the meetings, African and American senior executives planned to critically evaluate regional approaches to security cooperation and explore ways of how best to create, implement, and monitor programs that reflect African realities and security priorities while advancing U.S. strategic objectives and security interests. In her opening remarks, Ms. Amanda Dory, the U.S. Deputy Assistant Secretary of Defense for African Affairs, stressed the vital role that U.S.-Africa defense partnerships play in helping African countries improve security outcomes; shaping U.S. assistance to better reflect local priorities; and improving learning, coordination, and sharing of experiences between African, European, and American partners. Ms. Dory highlighted the interagency and whole-of-government approach to Africa policy, reflected by the participation of senior executives from the U.S. Defense Department and State Department. She also noted that the high-level dialogue was taking place at an opportune time in the lead up to the first U.S.-Africa Leaders’ Summit, which the President Barack Obama will host for leaders across the African continent in August, 2014. “We are here to listen, and to take your views and inputs into the ongoing planning process for this landmark event,” Ms. Dory told participants. In his keynote address, Mr. Derek Chollet, the Assistant Secretary of Defense for International Security Affairs, said that U.S. defense relationships with African nations are among the most dynamic in the world and have changed significantly in the past decade. “Many Americans, for instance would be surprised to know that 7 of the 10 fastest growing economies in the world are in Africa, and that many indicators such as infant mortality, access to education and health and life expectancy are improving and prosperity is growing,” Assistant Secretary Cholley told his fellow executives. 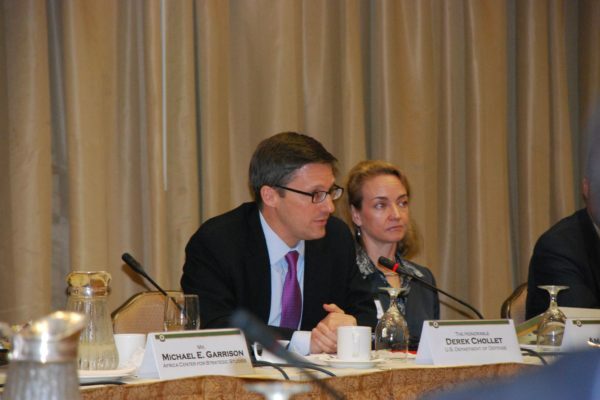 Assistant Secretary Chollet cited the key pillars underpinning U.S. strategy as captured in the 2010 National Security Strategy, 2012 Defense Strategic Guidance, 2012 U.S. Strategy Toward Sub Saharan Africa and the 2014 Quadrennial Defense Review (QDR). The Assistant Secretary told participants that the commencement address by President Obama to graduates at United States Military Academy at West Point, which was being delivered the same morning, would stress partnerships, targeted assistance, and more “nimble” but highly specialized forces. “We will be looking to you for more leadership,” he said. The Assistant Secretary suggested that U.S. policy and African priorities were mutually exclusive and not necessarily incompatible. Mr. Chollet concluded his remarks by stressing the importance of developing more holistic and comprehensive approaches. He echoed observations shared by several participants who argued that more attention needed to be given to addressing the structural roots of instability in Africa. “This must be a multi-level approach involving combat as well as noncombat assets and capabilities,” he noted.